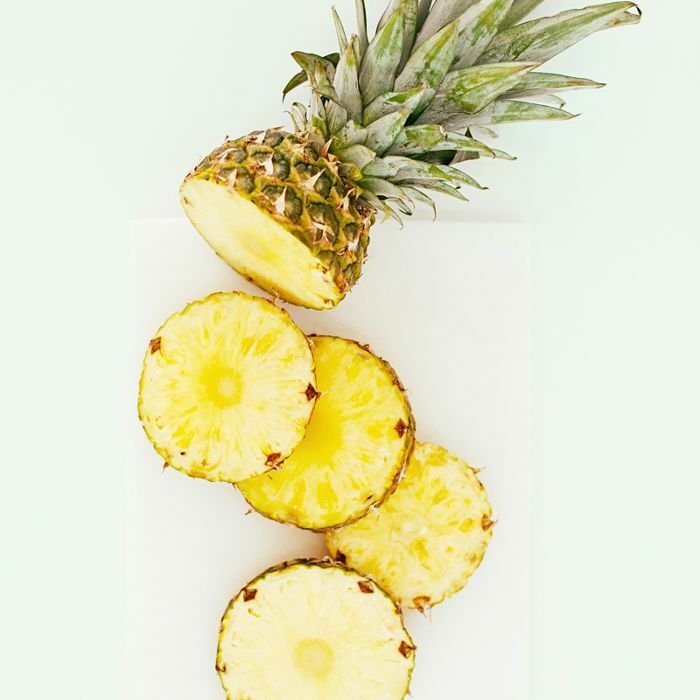 As the cornerstone of some of the healthiest smoothies, tastiest desserts, and a well-made piña colada, it’s easy to see why pineapple is universally adored. Interestingly enough, the pineapple has also historically served as a symbol of hospitality. In addition to a sweet, succulent flavor profile that pairs as naturally with yogurt and granola as it does with spicy peppers and mango, pineapple is an excellent source of nutrients such as vitamin C, dietary fiber, and manganese. While that hard, spiny exterior might make it tempting to head straight for the precut version in the produce aisle, learning how to cut a pineapple may be far easier than you think. Read on to learn how to cut a pineapple in six simple steps. As you may have guessed, the “crown” refers to the spiky cluster of leaves at the top of the pineapple. Position the pineapple on its side against the cutting board; then use your chef’s knife to cut straight down about a half inch beneath the base of the crown. To make slicing easier, cut the bottom portion of the pineapple as well to form a flat base that can stand upright. Once the ends have been removed, set the pineapple upright on the cutting board. Taking care to follow the natural curvature of the fruit, steady the pineapple by placing one hand firmly on the top; then slice downward with your knife just inside the skin. Slowly work your way around the pineapple, and be careful not to cut too deep: The sweetest section of the fruit is found just beneath the skin. Fortunately, this step isn’t quite as grisly as it sounds. Using your paring knife, gently remove the eyes (those little circular brown spots) one at a time. If you’re crunched for time, a quicker, easier method is to create diagonal, shallow V-shape strokes in the pineapple, allowing you to cut out multiple eyes at once. At the center of the pineapple is a tough, vertical core. This can be removed by positioning the pineapple upright and then slicing downward in a circular motion using your chef’s knife. Another option is to cut the pineapple in half and then cut around the core, creating vertical chunks of pineapple that can then be cut into smaller pieces. To cut a pineapple into slices or rings, return the pineapple to its side on the cutting board. Next, slice downward in parallel lines roughly half an inch to three quarters of an inch apart. Up next, keep reading to learn how to cut a watermelon in five easy steps.